So what is a social entrepreneur anyway? A social entrepreneur is a person who pursues novel applications that have the potential to solve community-based problems. These individuals are willing to take on the risk and effort to create positive changes in society through their initiatives. I took the path to social entrepreneurship when I was a youngster. As a self-professed misfit, I developed a heart for fellow misfits early on. Looking back, I’m sure being bullied because I was so shy, socially awkward, and extremely sensitive led me in this direction. The desire to fit in with my classmates was so strong yet so unattainable. I’d eventually retreat into a solitary world filled with books and creativity. Being voiceless is such an awful feeling. You feel helpless, hopeless, and invisible. While I had a strong sense of fair play, believed in truth, and doing the right thing, for some reason, I felt vulnerable and small. Yet, I found my voice the day my younger brother was picked on by one of my tormentors. Something in me just snapped and I chased down the creep. To this day I still have the scar on my knee from when we hit the ground as I whaled on him. Sticking up for my brother made me feel so good. Protecting him not only empowered me it felt like it was the right thing to do. Is it any wonder that I would become an advocate turned social entrepreneur? Contemplative, systematic, intentional along with the need to right wrongs drives me; it’s who I am. Advocating on behalf of other people is my purpose and my gift. It’s one of the reasons I created Bold Blind Beauty. Accepting the fact that I could no longer see was one of the hardest things I’ve had to do. What made it far more difficult were the societal reactions to blindness, blind people, and the wild misconceptions. My blindness helped me to ‘see’ that changing perceptions was needed to improve inequity and inequality for people with disabilities. We are living in a time where anyone can exercise their right to say anything about another for the whole world to see. It matters little whether what is being said is true or not, we can’t seem to use restraint in speaking our minds. For someone who has found their voice in speaking up for others the world of social media can be extremely overwhelming. Social media is so noisy and people like me don’t and won’t yell–it’s not our way. So when someone gets our message it’s so much more meaningful than fame or notoriety. I’m not interested in becoming rich or partnering with a fabulous company to take me to the next level. What I am interested in is changing perceptions not just for blind people but for anyone who has a disability. I believe beauty, real beauty is far more than aesthetics. Real beauty is deep, it’s who we are at our core. When I was young, I wanted nothing more than to fit in. Fast forward several decades, my strength and real beauty was found in being a misfit. Today, I choose not to follow the crowd and while I may be a misfit I’m a misfit who won’t compromise my principles. Blindness is not the problem. Disabilities are not the problem. The problem is how we as a society view people with disabilities. Not unlike a caste system, people with disabilities are widely looked down upon and seen as inferior. What’s so funny if it weren’t so sad is we are the only minority group where anyone can become a member at any time. As a social entrepreneur, I take my role here at Bold Blind Beauty very seriously. I’m protective of the people I feature here and the site’s messaging. 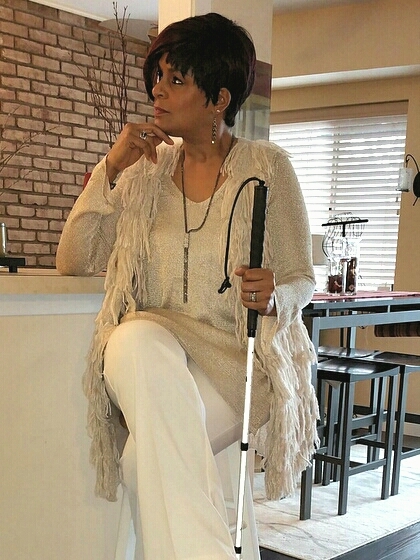 Abby, the fashion icon, articles, and the merchandise are all interconnected and designed to change people’s attitudes towards blindness. Appearance is only one small way to be beautiful. When the beauty of your youth fades will you like who you’ve become? A photo of me sitting on a bar stool at my counter. My chin is lightly resting on my propped up right hand. I’m wearing winter white pants with a creamy gold long sleeve v-neck sweater and matching fringed vest. I’m holding my white cane in my left hand. I’ve always known that you’re wonderfully insightful, Steph, and this piece demonstrates that in abundance. The part that resonated most deeply with me was your explanation about those with disabilities: “…we are the only minority group where anyone can become a member at any time.” These are wise words that will hopefully bring some awareness to those who have never considered how slim that boundary is. Most folks aren’t social entrepreneurs, but you demonstrate by example how we all have the capacity for being more socially mindful. People like you eradicate the barriers of ignorance everyday by putting your truest self out into the world. Thanks for that gift, Steph! I love this. Being bullied is no fun, but we press on. I applaud your defense of your brother. I thank you for defense of disabled people. I am, thanks for asking! Finished building a new website for my ‘coaching-part’. Looking into the options to also add podcast, so people can also listen to my tips and articles. Congrats on the new website Patty! Great post. As an entrepreneur, you’re a success. A special person too. I’m happy to be able to meet you regularly. Keep writing!